This is Danny Adlerman's 2nd album of all ages rock n roll! Kevin illustrated the CD and sings on a couple of the songs. Their reinterpretation of The Tomato Collection poem/song Sweet Pea Emily has received a large amount of air time on Sirius/XM Kids Place Live. "With a gentle sense of humor and playfulness, Listen UP! will be popular with many families looking for an album of kid-appropriate rock-n-roll." 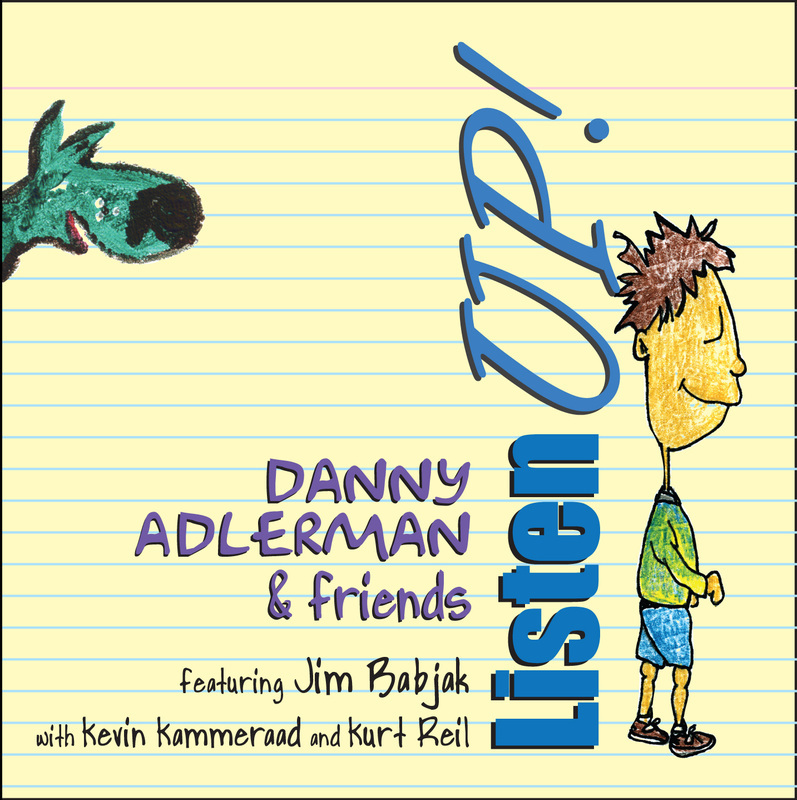 "Danny Adlerman assembled a group of talented musicians, including Jim Babjak of the Smithereens, for this eclectic collection of kid-friendly music. Most of the 12 tunes were either written by Adlerman or co-written with Babjak. The Buddy Holly-inspired “When I Grow Up” leads right into the contemporary pop rock “In the Future”; both songs focus on thinking about the singer’s future. Standouts include “The Veggie Song” (a rock tune about how yummy veggies taste), “Sweet Pea Emily” (a Caribbean-flavored tribute to a girl, featuring tight harmonies and percussion), “Too Much Pizza Blues” (a blues song about the effects of eating too much pizza), and “Hundred’s Day” (a country-flavored number celebrating the 100th day of school). The traditional call-response chant, “Flea Fly,” is a crowd-pleaser as it speeds up each time it is repeated. Closing the recording, Alderman sings “Rock-a-bye Baby” (a lullaby that channels the sound of the Beatles) from his book of the same title (Charlesbridge, 2004). The album’s humor and playfulness will appeal to the school-age crowd who are looking for music with just a little more sophistication than Raffi."